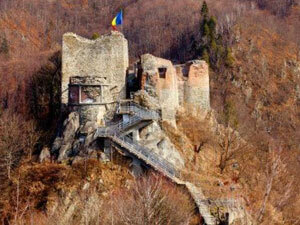 Poienari was a very small fortress having a garrison no bigger than 15 people. It is situated in the valley of the Arges river on a hill. It is a very strange place to place a fortification because the main tower was erected in 1290 and the rest of the construction in the 14th century and the first road over the Carpathians there did not appear until 1970, so strategically speaking the citadel does not defend a pass but only the treasure of the country and the family of the ruler, as a last point of resistance in case of invasion. You now need to climb about 1488 steps through the forest to reach the top where is the citadell. The entrance is situated between the ruins of the towers situated on the western side and from here starts a narrow corridor like a trap for the enemy. The corridor has on one side the main tower of the citadell built in 1290 by The Black Ruler or Thocomerius a Cuman noble who became the voivod of Wallachia and on the other side a wall which is built basiclly of river stones placed one above the other typical of construction from the 13-th century. On the southern side you’ll find the ruins of the towers and on the northern side where used to be another wall, long ago collapsed, now is a cement path which has on one side the big tower and on the another, the water cistern of the fortification. From here you can view the valley of the river Arges which flows at the foot of the citadel after escape from the dam situated 3 km away following the road to the mountains. The fortification is very interesting and you’ll never forget this trip. Of course if you’ll escape being bitten… by HIM!